We have Vintage Clothing and Hats for Famous and Historical African American Women. This 1950’s Lena Horne Costume is a sample of the Important Historical Women’s Outfits we can provide. Others would be Corretta Scott King, Josephine Baker, Harriet Tubman, Ruby Dee, Phillis Wheatley, Rosa Parks and many others form any Decade or Century. Let us help you find the outfits for Black Heritage Month, Historical Black Women, Juneteenth Celebrations, Famous Black Women, Important African American Women or for any Black Heritage Events. 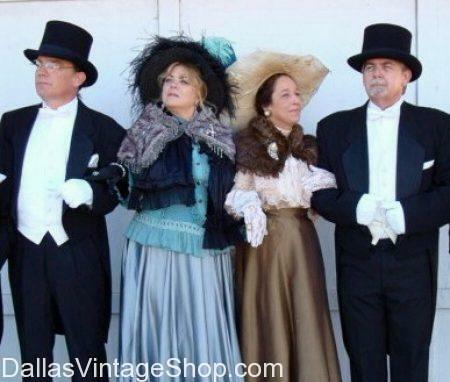 We have Complete Victorian, Dickens Era & Old West Outfits or just the Hats or Accessories you need. We have it all. Like a complete line Victorian Attire, Vintage Style Bowler & Top Hats, Elegant Victorian Capes & Dickens Era Attire, High Quality Victorian Fashions, Ladies Dresses, Mens 1800s Suits, Long Coats, Tail Coats, Morning Coats & Victorian Cloaks and Capes. Don’t forget we have Victorian Jewelry and everything you need to create the look you want. Technically, the Zoot Suit was more of fashion and attitude statement supposedly, first worn by some African American and Jazz Era Artists in the 20’s and 30’s and was eventually adopted by some men in the Latino, Chicano, Filipino and Italian communities, especially in L.A., which eventually led to the ‘Zoot Suit Riots.’ Meanwhile, in Chicago, Harold C. Fox, a clothier and sometime big-band trumpeter claimed credit for creating and naming the zoot suit with the reet pleat, the reave sleeve, the ripe stripe, the stuff cuff and the drape shape that was the stage rage during the boogie-woogie rhyme time of the early 1940’s. Subsequently, Broadway Productions, Hollywood Movies, the gentleman’s ‘High Fashion,’ and “Church Brothers’ clothing industry have utilized, modified and often exaggerated the Zoot Suit for their own purposes. So have Costume Theme Party Goers. Therefore, we have a ridiculously huge collection of outlandish and wonderful Zoot Suits, Zoot Hats, Men’s Pimpin’ Ties & Pocket Squares, Canes, Zoot Chains and more, all useful for Prom, Homecoming, Fabulous Theme Parties and Sunday-go-to-Meeting Attire. Dallas Largest Hat Shop for Men: Godfathers, Zoots, Derbies, Fedoras, for Urban Wear, Etc. We are the Largest Mens Hat Shop in Dallas and North Texas. We carry over 10,000 hats for men in 100’s of styles in every color and quality imaginable in huge quantities. Posted in 1920s Men, 1930s Men, 1940s Men, Derby Gents, Gangsters, Great Gatsby, Guys and Dolls, Hats Men, Kentucky Derby, Men’s Fashion, Motown, Prom and Homecoming, Prom Tuxedos and Suits, Show Biz, Showmen, Swing Dance, Swing is King, The Great Gatsby, Urban & High Fashion, Vintage Hats | Comments Off on Dallas Largest Hat Shop for Men: Godfathers, Zoots, Derbies, Fedoras, for Urban Wear, Etc. Mens Bowler Hats, Mens Derby Hats, Mens High Fashion Hats, Mens Victorian Hats, Mens 1920s Hats, Mens Vaudevillian Period Hats, Mens Vintage Hats, Mens Magician Formal Attire Hats, Mens White Bowler Hats, Gentlemens Period Hats and they come in any color imaginable. Mens Vaudeville Bohler Hats, Mens Derby Hats, Mens High Fashion Hats, Mens Victorian Hats, Mens 1920s Hats, Mens Period Hats, Mens Vintag Hats, Mens Bowler Hats, Mens Derby Hats, Mens High Fashion Hats, Mens Victorian Hats, Mens 1920s Hats, Mens Period Hats, Mens Vintag Hats, Mens Formal Attire Hats, Mens White Bowler Hats, Gentlemens Period Hats and they come in any color imaginable. Posted in 1920s Men, 1930s Men, Children's Theatrical Costumes, Derby Gents, Dickens, Dickens on The Strand, Hats Men, Kentucky Derby, Lone Star Park Derby Day Hats, Magic, Men’s Fashion, Prom and Homecoming, Prom Tuxedos and Suits, Scarborough Fair Steampunk, Show Biz, Showmen, Urban & High Fashion, Urban Cowboys, Vaudeville, Victorian Men, Vintage Hats | Comments Off on Mens Bowler Hats, Mens Derby Hats, Mens High Fashion Hats, Mens Victorian Hats, Mens 1920s Hats, Mens Vaudevillian Period Hats, Mens Vintage Hats, Mens Magician Formal Attire Hats, Mens White Bowler Hats, Gentlemens Period Hats and they come in any color imaginable. You are in Vintage Hats category.